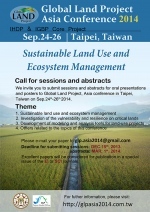 GLP invites you to submit sessions and abstracts for oral presentations and posters to the 2014 GLP Asia Conference – Sustainable Land Use and Ecosystem Management, which will be held in Taipei, Taiwan on September 24th – 26th 2014. 4. Others related to the topics of this conference.